I purposely neglected my diet plan yesterday noon, cos McDonald was just in front of me, double cheese beef burger waving at me...begged me to eat it. I hardly control myself. Thus, yesterday I didn't diet. Hu hu huu...but I have no regrets, double cheese beef burger is just too delicious. BUT, next time I wouldn't want to pass by McDonald. LOL! 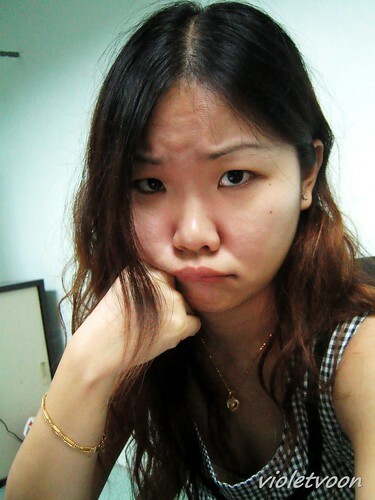 The girl living Violet decided to punish me, this morning, I have sore throat. I HATE sore throat, if I can choose, I will choose fever but not sore throat! Was it because of french fries? I don't normally on the radio when I drive, cos I think I sing better than the radio (of course! radio doesn't sing right? :P ). SORE THROAT..makes me sick and I cannot sing when I drive :( Few weeks ago I went for a movie with Kevin, that's "Speed racer", quite a movie...and I discovered the monster living in me...I LOVE speed. Sigh...I drank a few glasses of warm water, I hope my throat would be fine by tomorrow. My friend the dietitian said it was all right to let yourself have one "indulgent" meal a week. It helps you feel less deprived and happier so you stay on your diet. But from my experience, if I didn't drink a lot of water after French fries, I will have sore throat the next day..